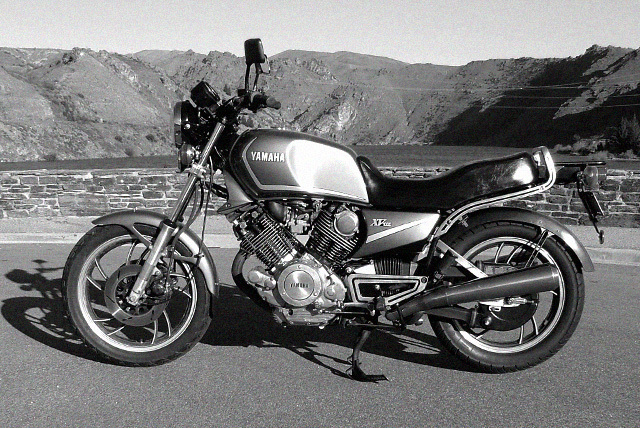 Like both Munro and Britten, Kiwi George Payn has a day job, so as seems to be the way in NZ he spends his nights and down time building bikes. A lifelong love of building and restoring motorcycles and hot rods means he knows his way around the tools and his passion is shared by his wife and son. 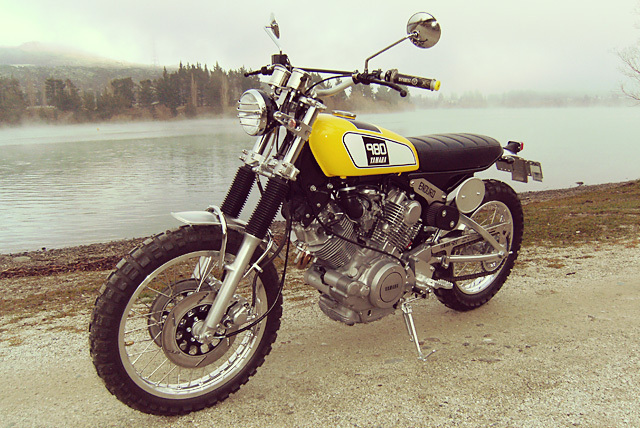 What really gets their blood pumping is old Yamaha’s, “ there’s even a 1979 TT500 as a design feature in our lounge”, so it made perfect sense that not only would the next build be a Yammy it would be inspired by one too. As George explains “Having reached an age where the mid-life crisis kicks in, I decided ‘we’ needed a scrambler-themed TR1 based on the 1975 DT400 to add to our collection. The inspiration coming from Greg Hageman’s builds and memories of the TR1, my first road bike”. 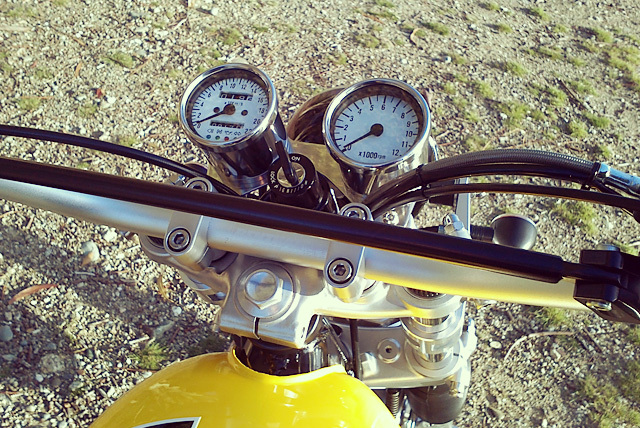 So after some careful hunting around a donor bike was finally found, an ’81 TR1 with around 40,000 miles on the clock. 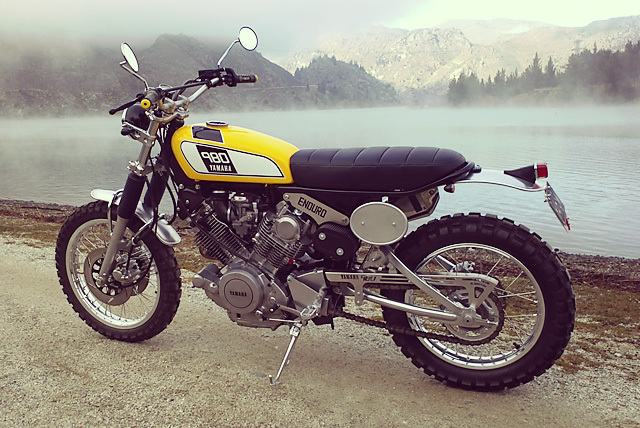 With some old spares in the garage, his wife and son lending a hand, George got down to business in turning the touring focused Yamaha into a go anywhere with rooster tails Scrambler. With the bike stripped down the frame was given a good clean up before being sprayed in hard-wearing black powder coat and set to bake. To bring up many of the other parts that would remain to an equal standard, the alloy has been vapour blasted to restore its original luster and the steel components including the swingarm treated to an alloy ceramic coating. 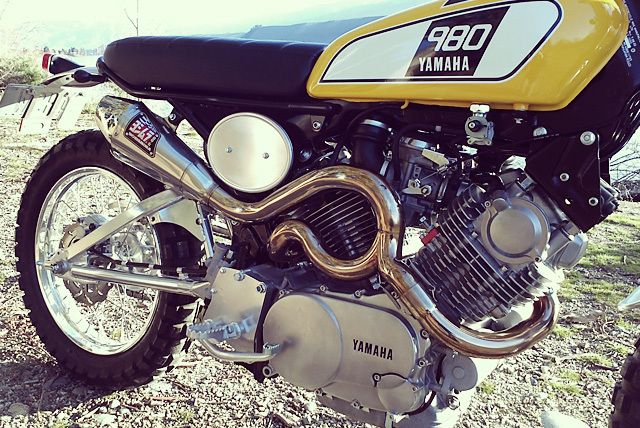 All of which serves to give the home-built bike an appearance as if it has rolled straight off a modern factory floor. Following the lead of the Hageman bikes that helped to inspire this build George fabricated a new subframe that cleaned up the lines of the TR1 and would suit the style of seat he had in mind. While he was in the fabricating mood George also knocked out a battery box to keep things neat and tidy and also designed and laser cut the amazing chain guard that even features the bikes logo for that extra custom touch. He wasn’t finished there as he also designed a new dash and all the mounting brackets that support the custom additions and they too were laser cut for an exacting finish. 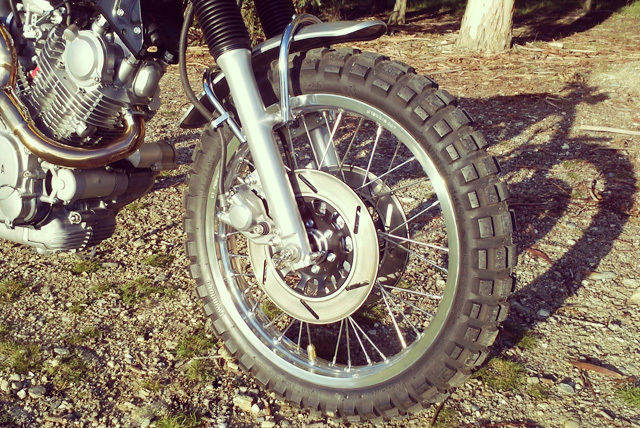 With the Scrambler look he was after and the aggressive tyres that would be sure to throw mud every which way, a good set of fenders was a must and are the only totally out sourced parts of the build. The front fender that is attached with round bar as well as the rear fender and race plates all made in alloy come from Cooper Smithing in George’s particular specifications. For the tank most Yamaha V-Twin builders stick with the stock item or follow the Hageman lead and retro fit a Mojave tank. But this Yamaha family wanted to show just how deep the passion for the marque runs in their blood; so with a set of custom mounts made and a new fuel tap adapted they fitted up a ’70s R5 unit. 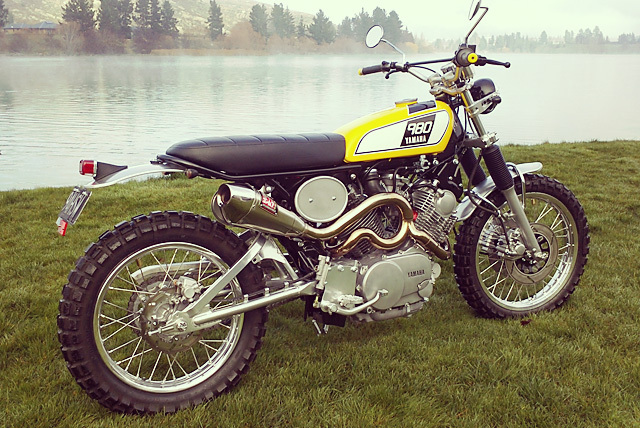 It suits the Scrambler look to perfection and so serious were they about its look, “my wife and I designed the graphics and paint using AutoCAD to achieve the right proportions”. With an exposed air filter on the induction side and a Yamaha R6 Yoshimura muffler topping off the new exhaust there is no doubt you can hear something special is coming before you finally lay eyes on the TR1. While George got to work on the custom wiring and electricals he made sure the family stayed involved, “I even flirted with danger, putting my wife to work re-lacing the wheels and called on our son to machine a few parts in his spare time.” Those wheels are a 19in XS650 wheel that utilises the TR1 brakes at the front and at the rear an 18in XR650 unit that has been fitted with a CR500 brake, with both ends wrapped in Continental TKC80 tyres. The footpegs have been relocated for a more fitting riding position with custom pegs and brackets, while the rear brake system is also of George’s design. The Renthal vintage bars with Yamaha grips further aid in transforming the riding position from highway tourer to a more trail friendly feel. With the fabrication work now complete the custom wiring could be finished off with it all starting thanks to a Shorai Lithium ion Battery in the new box. The ever popular Motogadget m-unit controller takes centre stage with Motone bar switches keeping the look minimal and TT500 lights & mirrors for that truly authentic feel. They say “a family that prays together stays together” and when you worship at the altar of Yamaha the Payn family have surely ensured they’ll enter the tuning fork logo’d gates of heaven. 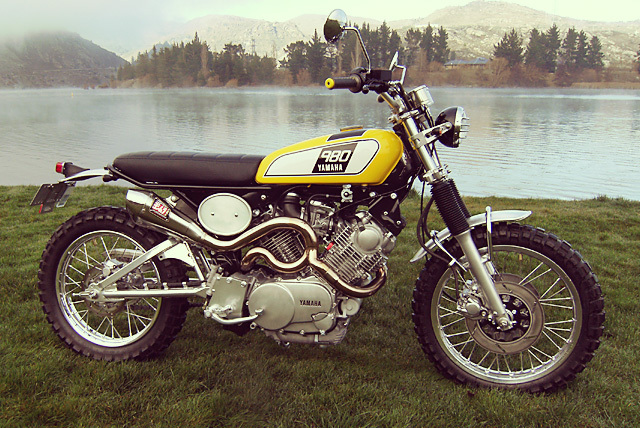 Munro went fast in a straight line, Britten crafted an incredible track machine and Payn has built the perfect Scrambler to explore the amazing scenery that surrounds him; and they all did it from home, it’s quite simply the Kiwi way.